Websites, blogs and social media will now be able to legally use iconic photographs of superstars such as Marilyn Monroe and Sean Connery as Getty Images decides to giveaway 35 million of its stock photographs for free. The world’s largest photo agency believes the move will help combat piracy. “Millions and millions of people are using this content without licence — they’re right-clicking and stealing it,” Craig Peters, the company’s head of product and content development was quoted as saying in The Guardian. The images, which will be embedded with a code that links it back to Getty’s website, can be published on websites, blogs and social media free of charge, provided they are not used to directly promote a product, service or business. 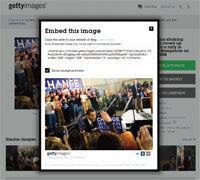 Images cannot be resized and they will all incorporate a Getty Images logo, as well as a credit for the photographer. The embedded code, which can be cut and pasted onto any website, is similar to YouTube that provides embedded links for sharing its videos.